Since its foundation in 1988 BRINOS has held “ear camps” in March and November of each year. By 2013, 51 ear camps had been undertaken, with around 50,000 patients treated and over 5,000 major ear surgery operations performed. 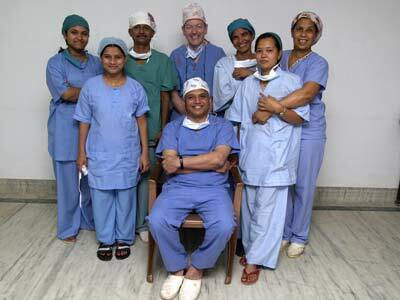 In the early years of BRINOS ear camps were held both in the eastern and western ends of Nepal. For some time in the early 1990’s camps were held in Dharan, where the British Military Hospital had been established. In more recent years BRINOS has concentrated its work in the town of Nepalgunj in the south western Terai, working initially with the Fateh-Bal Eye Hospital, then with the Nepalgunj Medical College (2001-March 2007), and since November 2007, back at the Fateh-Bal Eye Hospital. Patients for each ear camp are pre-selected through the Primary Ear Care programme. A team of 2 or 3 British surgeons, 2 operating theatre nurses and an anaesthetist join forces with Nepalese surgeons and local theatre staff. Just over 100 major ear operations are perfomed over a nine day period, using three operating tables running simultaneously. 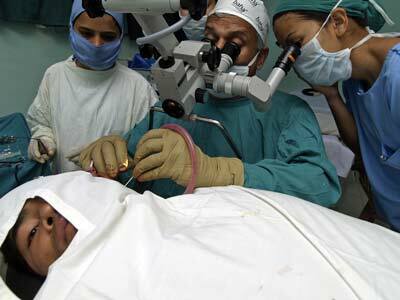 Most operations are performed under local anaesthetic with the patients awake. Surgery involves repair of ear drum perforations (myringoplasty), eradication of potentially serious middle ear disease (mastoidectomy) and restoration of the hearing for those suffering with a condition known as otosclerosis (stapedectomy). Patients stay in hospital for two days and aftercare is undertaken by the primary ear care team.